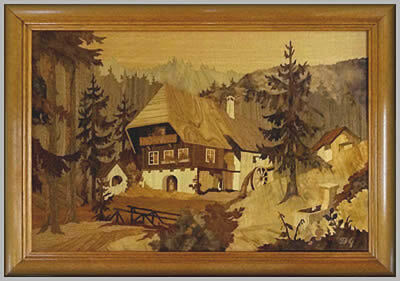 October's update brings two Buchschmid and Gretaux wood inlays in amazingly almost original condition. How they have managed to remain in such condition is explained in the text accompanying the pictures. You will find that it is all due to the annual application of a special oil which was supplied with the pictures at the time of purchase. Our October update brings you a couple of B & G wood inlay pictures in extremely good condition. "My parents purchased a B&G wood inlay when stationed in Germany in the late 70s. My husband and I are lucky enough to be stationed here again. My parents have asked me to see if I can find some of the oil that is recommended for cleaning/conditioning these inlays. They were given a bottle when they purchased them and have been hoarding it to make it last as long as possible. Unfortunately it did not have a label. Does anyone know what they should use and how/where I might find it?" 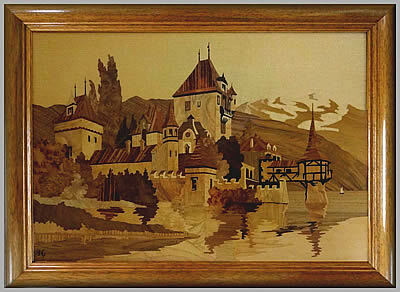 "The Black Forest Water Mill was purchased in the late 1970's when I was stationed in Germany in the U.S. military. It's reverse side had no stickers but Herr Chlup included documentation separately. 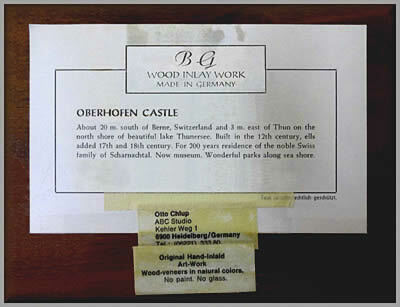 The Oberhofen Castle was purchased in 1981 via mail from ABC Studio and Herr Chlup. These two inlays are 24-inch x 17-inch and in good condition. As we live in Colorado, a very dry state, and the inlays came from Germany, a very wet country, we have tried to keep the inlays dusted and oiled annually to mitigate the effects of our dry climate. We seem to have had some luck and our inlays appear very nearly original. " The regular application of the supplied oil on the pictures is the principal reason they have remained in such good shape. The oil in question is actually Lemon Oil. You can purchase bottles of this from guitar shops. It is used for maintaining the playing quality of Rosewood fret boards. It is also available online from places such as Amazon. 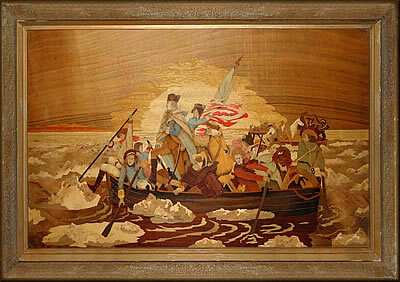 The picture is a marquetry interpretation of a painting by Emanuel Leutze. The original hangs in the Metropolitan Museum of Art and there is a copy in the White House. We are afraid we do not know who made it though. Click the above button to return to page 48 of "Can You Help"